Trigonometry (from Greek trigōnon, "triangle" and metron, "measure") is a branch of mathematics that studies relationships between side lengths and angles of triangles. The field emerged in the Hellenistic world during the 3rd century BC from applications of geometry to astronomical studies. In particular, 3rd-century astronomers first noted that the ratio of the lengths of two sides of a right-angled triangle depends only of one acute angles of the triangle. These dependencies are now called trigonometric functions. Trigonometry is the foundation of all applied geometry, including geodesy, surveying, celestial mechanics, solid mechanics, navigation. Trigonometric functions have been extended as functions of a real or complex variable, which are today pervasive in all mathematics. The modern sine convention is first attested in the Surya Siddhanta, and its properties were further documented by the 5th century (AD) Indian mathematician and astronomer Aryabhata. These Greek and Indian works were translated and expanded by medieval Islamic mathematicians. By the 10th century, Islamic mathematicians were using all six trigonometric functions, had tabulated their values, and were applying them to problems in spherical geometry. The Persian polymath Nasir al-Din al-Tusi has been described as the creator of trigonometry as a mathematical discipline in its own right. Nasīr al-Dīn al-Tūsī was the first to treat trigonometry as a mathematical discipline independent from astronomy, and he developed spherical trigonometry into its present form. He listed the six distinct cases of a right-angled triangle in spherical trigonometry, and in his On the Sector Figure, he stated the law of sines for plane and spherical triangles, discovered the law of tangents for spherical triangles, and provided proofs for both these laws. Knowledge of trigonometric functions and methods reached Western Europe via Latin translations of Ptolemy's Greek Almagest as well as the works of Persian and Arab astronomers such as Al Battani and Nasir al-Din al-Tusi. One of the earliest works on trigonometry by a northern European mathematician is De Triangulis by the 15th century German mathematician Regiomontanus, who was encouraged to write, and provided with a copy of the Almagest, by the Byzantine Greek scholar cardinal Basilios Bessarion with whom he lived for several years. At the same time, another translation of the Almagest from Greek into Latin was completed by the Cretan George of Trebizond. Trigonometry was still so little known in 16th-century northern Europe that Nicolaus Copernicus devoted two chapters of De revolutionibus orbium coelestium to explain its basic concepts. Cosine function (cos), defined as the ratio of the adjacent leg (the side of the triangle joining the angle to the right angle) to the hypotenuse. Fig. 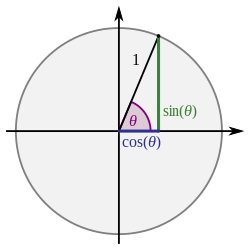 1a – Sine and cosine of an angle θ defined using the unit circle. Graphing process of y = csc(x), the reciprocal of sine, using a unit circle. One way to remember the letters is to sound them out phonetically (i.e., SOH-CAH-TOA, which is pronounced 'so-ka-toe-uh' /soʊkæˈtoʊə/). Another method is to expand the letters into a sentence, such as "Some Old Hippie Caught Another Hippie Trippin' On Acid". Sextants are used to measure the angle of the sun or stars with respect to the horizon. Using trigonometry and a marine chronometer, the position of the ship can be determined from such measurements. ^ "trigonometry". Online Etymology Dictionary. ^ Boyer (1991). "Greek Trigonometry and Mensuration". A History of Mathematics. p. 162. ^ Otto Neugebauer (1975). A history of ancient mathematical astronomy. 1. Springer-Verlag. pp. 744–. ISBN 978-3-540-06995-9. ^ "Al-Tusi_Nasir biography". www-history.mcs.st-andrews.ac.uk. Retrieved 2018-08-05. One of al-Tusi's most important mathematical contributions was the creation of trigonometry as a mathematical discipline in its own right rather than as just a tool for astronomical applications. In Treatise on the quadrilateral al-Tusi gave the first extant exposition of the whole system of plane and spherical trigonometry. This work is really the first in history on trigonometry as an independent branch of pure mathematics and the first in which all six cases for a right-angled spherical triangle are set forth. ^ "the cambridge history of science". October 2013. ^ electricpulp.com. "ṬUSI, NAṢIR-AL-DIN i. Biography – Encyclopaedia Iranica". www.iranicaonline.org. Retrieved 2018-08-05. His major contribution in mathematics (Nasr, 1996, pp. 208-214) is said to be in trigonometry, which for the first time was compiled by him as a new discipline in its own right. Spherical trigonometry also owes its development to his efforts, and this includes the concept of the six fundamental formulas for the solution of spherical right-angled triangles. ^ "Regiomontanus biography". History.mcs.st-and.ac.uk. Retrieved 2017-03-08. ^ Grattan-Guinness, Ivor (1997). The Rainbow of Mathematics: A History of the Mathematical Sciences. W.W. Norton. ISBN 978-0-393-32030-5. ^ Robert E. Krebs (2004). Groundbreaking Scientific Experiments, Inventions, and Discoveries of the Middle Ages and the Renaissance. Greenwood Publishing Group. pp. 153–. ISBN 978-0-313-32433-8. ^ Weisstein, Eric W. "SOHCAHTOA". MathWorld. ^ A sentence more appropriate for high schools is "'Some Old Horse Came A''Hopping Through Our Alley". Foster, Jonathan K. (2008). Memory: A Very Short Introduction. Oxford. p. 128. ISBN 978-0-19-280675-8. ^ Intel® 64 and IA-32 Architectures Software Developer's Manual Combined Volumes: 1, 2A, 2B, 2C, 3A, 3B and 3C (PDF). Intel. 2013. ^ "JPEG Standard (JPEG ISO/IEC 10918-1 ITU-T Recommendation T.81)" (PDF). International Telecommunications Union. 1993. Retrieved 6 April 2019. ^ Lecture 3 | Quantum Entanglements, Part 1 (Stanford), Leonard Susskind, trigonometry in five minutes, law of sin, cos, euler formula 2006-10-09. Christopher M. Linton (2004). From Eudoxus to Einstein: A History of Mathematical Astronomy. Cambridge University Press. This page was last edited on 8 April 2019, at 13:55 (UTC).